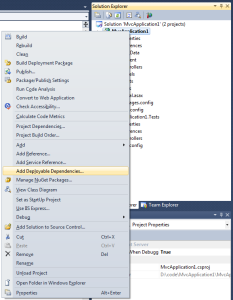 As of Visual Studio 2010 SP1, there’s an easier way to do everything below. 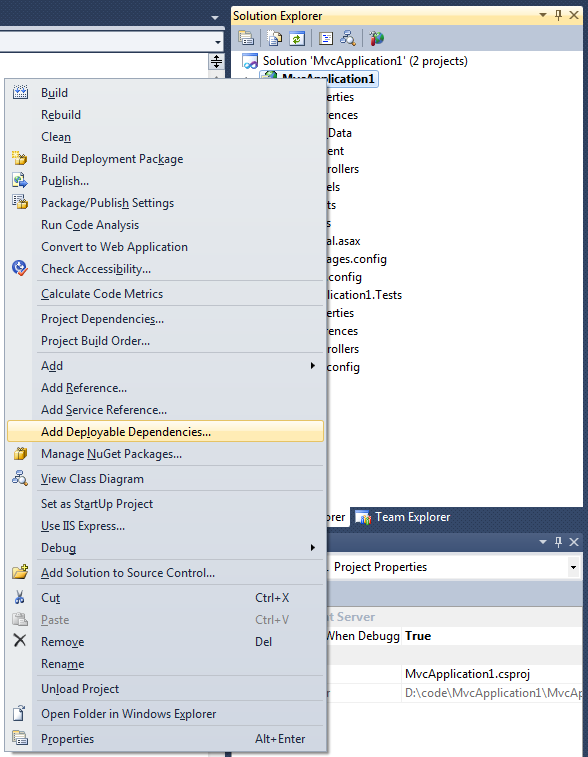 In the Solution Explorer, right click the project and select ‘Add Deployable Dependencies…’, select the dependencies you want to include, and click OK. 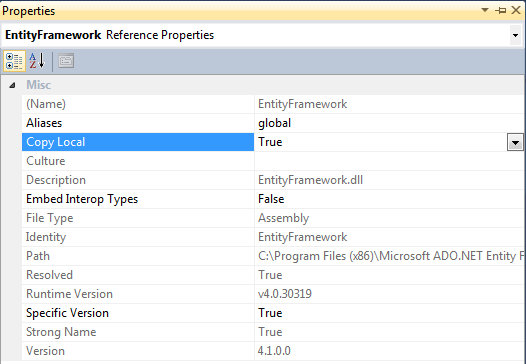 This will generate the folder _bin_deployableAssemblies with the proper DLLs. Now when you build your solution, the DLLs in _bin_deployableAssemblies are copied to the bin folder. See Scott Hanselman’s post for a more thorough explanation. I have built an ASP.NET project using SQL CE 4.0 and Entity Framework 4.1. When the time came to deploy the web application to our managed environment, I ran into some issues due to some missing references. Do to the nature of our hosted environment, installing the EntityFramework and SQLCE4 libraries was not an option but I have worked out all of the required steps to get the web application working in the deployed environment. The following libraries should be referenced in your project. Make sure to set the Copy Local property to true. The following files should be copied as part of your build script process. These files are placed on your file system when you install the SQL CE 4 package. Recently, I have been working on a few projects that require an ajax friendly life cycle for an ASP.NET web application. Much of the work I did is based on Rick Strahl’s post: http://www.west-wind.com/weblog/posts/896411.aspx. Working on top of what I learned from this article, I decided to leverage the rich capabilities of .NET’s Web UI components as part of my ajax implementation using HTML injection. I used jquery to bind a standard button to make a call to my Web Service method. The service created and populated a standard GridView object. The service would then render that object and return the HTML that was generated. This HTML, once returned by the service call, would be injected into a DIV tag that served as the container for the results table. My initial implementation is a naive solution that renders full HTML on the server side and passes that back to the client-side. My ASP.NET page already has a script manager so I added a reference to my web service (simple .asmx in this scenario). I have created the site using ASP.NET and SQL Server. I made this decision solely because I use Microsoft’s platform every day for my professional work. The pictures page (http://www.bootbootreboot.com/pictures) allows visitors to add their own pictures. Upon uploading a picture, a thumbnail is also generate for that picture. The code below shows how to create a thumbnail of an uploaded image. Recently, I have also been introducing some new ajax functionality using jquery and .NET web services. This combination has allowed me to easily introduce a “preview” feature for uploading images and YouTube videos. The site is being updated to use the Youtube play list as the content manager for the videos page. Comments and ratings will be retrieved for the detail page and visitors to bootbootreboot.com can add their own comments and ratings.